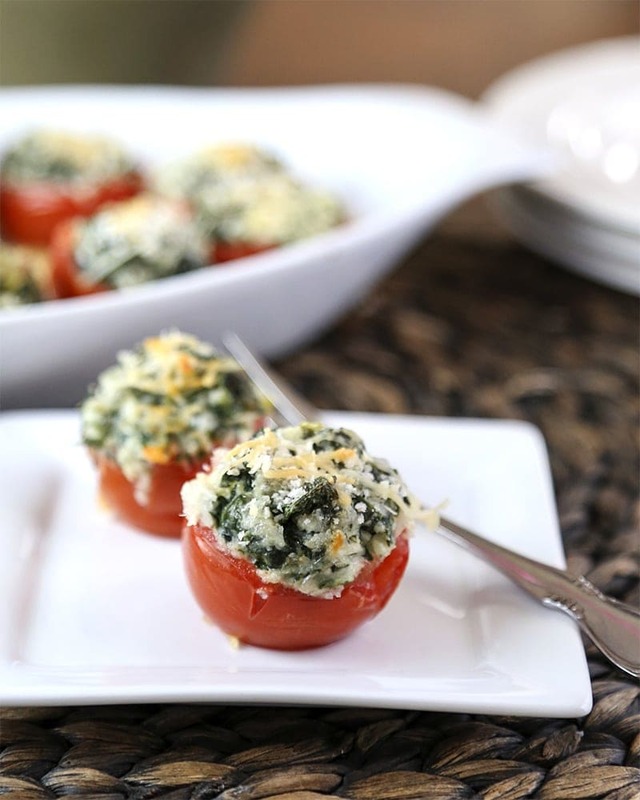 Fresh spinach and “cocktail” tomatoes pair together perfectly in these Spinach Stuffed Tomatoes for a colorful, healthy bite-size appetizer. 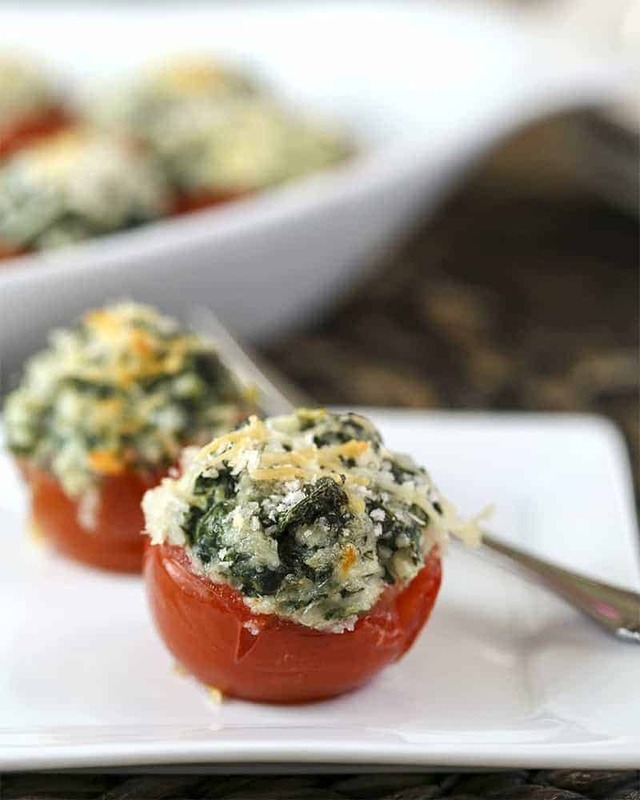 With Easter weekend just around the corner, I’ve been looking for some Spring-like appetizers and side dishes and I think that these Spinach Stuffed Tomatoes definitely hit the mark! 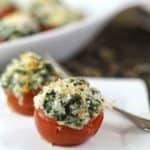 Cocktail tomatoes (small tomatoes like Campari tomatoes) are hollowed out and stuffed with a cheesy spinach filling and baked until bubbly. 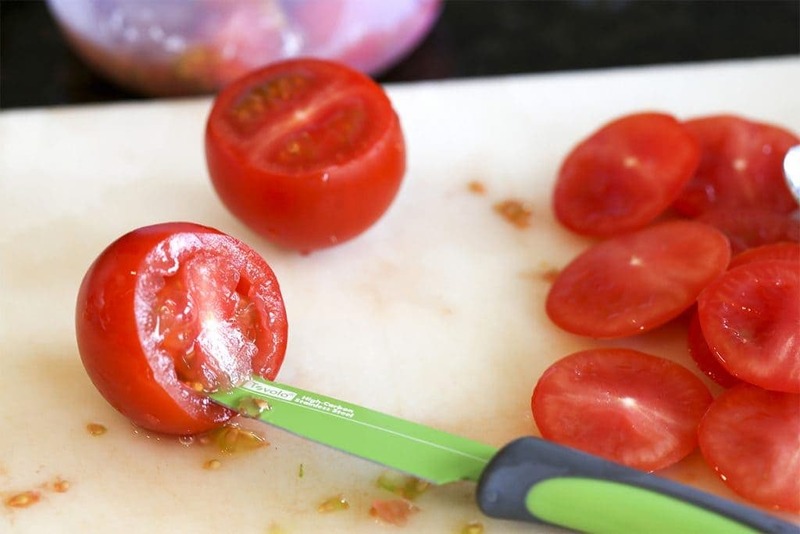 The first step is to cut a small slice off the top of the tomatoes and using a small paring knife carefully remove the pulpy seeds and flesh inside. Be careful not to puncture the sides of the tomatoes. Lightly salt the insides and then turn them upside down to drain for 15 minutes to allow extra moisture to release. Next, steam fresh spinach and drain off any extra moisture, then give it a rough chop and mix with sautéed green onions, sour cream, and Parmesan cheese. Stuff the tomatoes with the spinach mixture and sprinkle with more cheese and Panko bread crumbs. Bake for 20 minutes until hot and bubbly, then serve immediately. Doesn’t this make a pretty presentation?! A one-pound of “cocktail” tomatoes will have around 10-12 tomatoes in each package and the filling recipe below makes the perfect amount for stuffing. 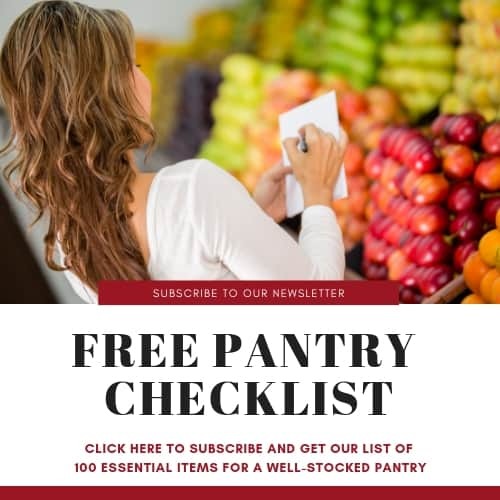 If you need to serve a larger group, you can easily double this recipe. 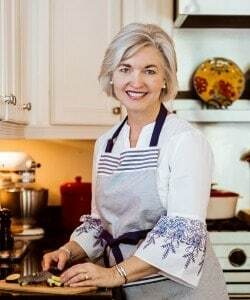 I like serving this dish as an appetizer, but you can stuff the filling into four normal-size tomatoes instead and it makes a delicious side dish, too! Sprinkling extra Panko crumbs and Parmesan cheese on top before baking results in a crispy top. 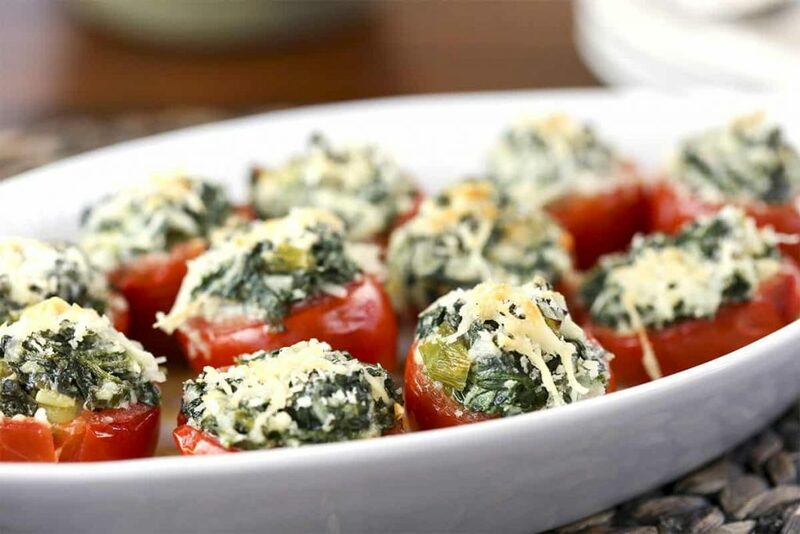 Fresh spinach and "cocktail" tomatoes pair together perfectly in these Spinach Stuffed Tomatoes for a colorful, healthy bite-size appetizer. Wash and dry tomatoes. Cut the tops off the tomatoes and scoop out the centers, being careful not to puncture the sides. Sprinkle the inside with salt, then turn the tomatoes upside down and drain for 15 minutes. Steam the spinach for 1-2 minutes, and drain well. Squeeze out excess water and give the spinach a rough chop. Sauté onions in butter over medium heat until translucent. Remove from heat and stir in the spinach, sour cream, Parmesan cheese, and a dash of cayenne pepper. Add one tablespoon Panko breadcrumbs and season with salt and pepper. Divide filling and stuff the tomatoes evenly. 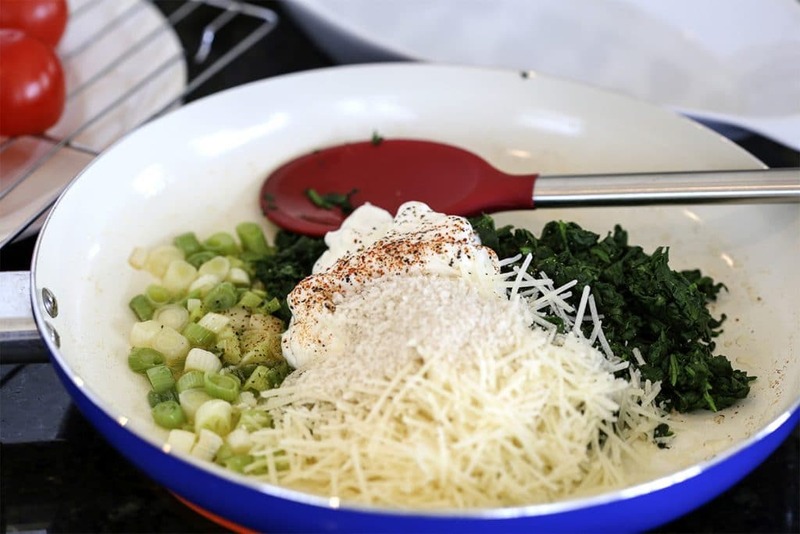 Place in a lightly greased baking dish and sprinkle with more breadcrumbs and Parmesan cheese. Bake for 20 minutes or until hot and bubbly. Adapted from The Fresh Market Cookbook.